1. Plan months ahead. Decide on a place, somewhere North-ish, that you would like to go. 2. Buy the necessary camera equipment, like a sturdy tripod, a cable shutter release, and a wide-angle lens. Also buy a ton of warm clothes and a gigantic thermos on Amazon, because who wants cold toes while waiting for the aurora? 3. Do a lot of Internet research on best locations, aurora-hunting strategies, times of day, times of year, and sciencey stuff behind what causes it. Read and re-read to make sure you’ve memorized everything. 4. Wait the several months until the day of your trip arrives. Build up tons of anticipation and excitement. 5. Check the weather the week you arrive at your Northerly location. Realize it’s 90% cloud cover this time of year and the aurora is about as predictable as a drunk raccoon. 6. Set your hopes aside to focus on other things, like the first-caught langoustines of the season, dunked in butter and cheese. 7. Prepare to go home with an empty SD card but a lot of other good memories. 8. Step into your hotel room and see a weird misty band across the sky. 9. Gape in awe from your fourth-floor lookout. It’s only a Level 2 aurora, but it’s still mysterious and stunning. Then flee the city lights as fast as you can. 10. 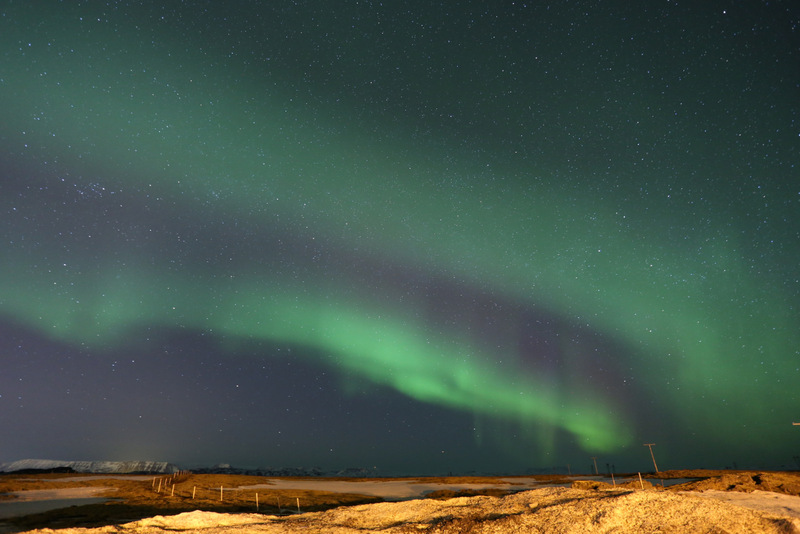 Watch the aurora from a hastily spotted abandoned gas station by the roadside, about 10 miles outside of Reykjavik. Snap tons of photos until the camera battery dies. Realize it’s so cold you no longer have feelings in your toes, but it doesn’t matter. Because despite all that prep and then understanding and then resignation, you still got to see the aurora on your last evening in Iceland.